Oh my. So over on my Twitter account, I tweeted a tweet that has now been favorited, retweeted, mentioned, ?distorted, and tagged such that I've received over 30 notifications on all sorts of stuff I'd rather have nothing to do with. So let me start the story at the beginning. Earlier in May, the New York Times ran a column called This is My Brain on PMS. 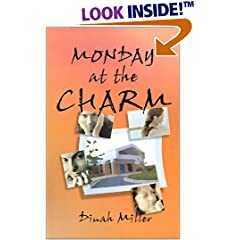 It was a first person account of someone's mental anguish and emotional instability during the premenstrual time. I read this and thought "Really?" Did this esteemed psychiatrist really just publically refer to an introspective piece about a patient's distress with the hashtag "narcissist"? Why? I assumed (but I don't know) that Dr. Lieberman never evaluated the author of the article and that this was not a clinical diagnosis, but a diagnostic term used in it's street meaning, so a hurled insult or name calling. To my uninformed read, the past president of the APA was calling a patient names! I felt protective of the author and I felt a bit embarrassed for my profession, though perhaps I misunderstood the intent here. I just don't know. @DrJlieberman Why is a patient's narrative of their difficulties 'narcissism'? #insulting. Perhaps public accounts are destigmatizing. Dr. Lieberman responded that he did not mean to be insulting but that the NYTimes never publishes serious scientific stuff about psychiatry. Gracious enough for Twitter. This was all on May 5th. 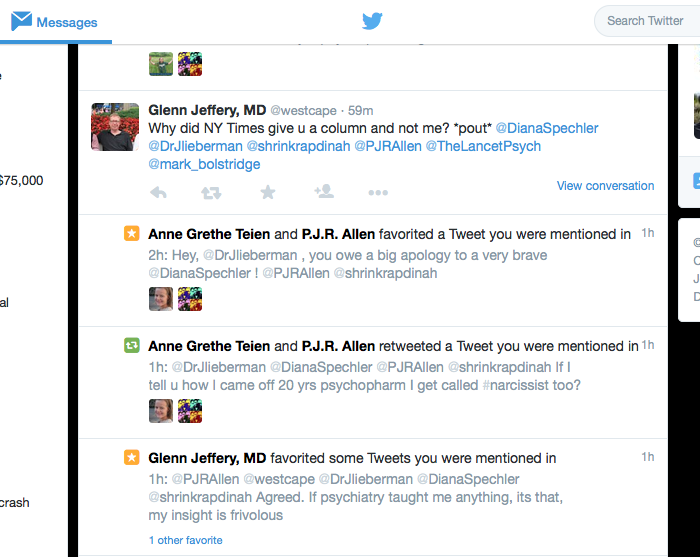 Let's be real here: I don't know Dr. Lieberman, and I don't know Diana Spechler, the author of the PMS article. This had nothing to do with me and these people are all entitled to their opinions. Why did I stick my 2 cents in here? I don't need any more enemies (Shrink Rap comes with it's own set of haters). I should have resisted the urge to comment. I would not have given it another thought, but today my Notification marker was popping up numbers again and again. I was retweeted, favorited, and tagged on a bunch of posts I didn't understand. 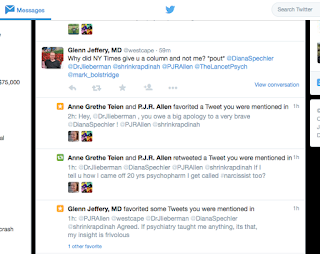 Dr. Lieberman was being insulted -- tagged as a symbol for all that is wrong with academic psychiatry, among other things. My account was tagged along with some other psychiatry bloggers, a Forbes health writer, Ms. Spechler, and The Lancet to name a few linked on to these less-than-friendly tweets. Since it was beyond me to respond in 140 characters, I'm doing it here. To @Dr. Lieberman: Forgive my intrusion to your twitter feed. To @boringyoungman who likes to stir things up from an anonymous handle: as per my tweets, you need to add your name. There's no credibility in someone who provokes with no clear identity. To @Matthew Harper perhaps you'd like to write an article comparing Shrinks to Shrink Rap. I haven't read Shrinks so I don't know if it would work, but scream if you want a copy of our version of Telling-it-Like-it-is-Psychiatry. To all involved, Tweet what you like, but please don't tag me on anything that insults someone. I am retracting my #insulting hashtag. I love you Dinah! You are so spontaneous and do not suffer from the "delayed response disorder" that so many shrinks do. Shrinks who are well trained but have the ability to respond with emotion that is authentic need to speak about this experience. A lot of our training is to not do this. Welcome to New York Presbyterian-Columbia University Medical Center. 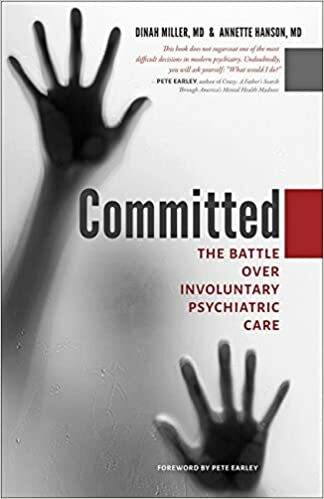 Rated #2 in psychiatry in the country. I guess I didn't see Jen's post before--but I have to say that I trained at Columbia Presbyterian and I totally agree. They do psychoanalytic training there and so any variance of human experience is not going to be welcomed as a normal human variance. Psychodynamic therapy is very pertinent to treatment today. But the old school Lieberman model is questionable.